Encouraging heel growth and developing less tender hooves? Home » Horsecare » Hoof Care » Hoof Care » Encouraging heel growth and developing less tender hooves? Thanks! She did have a long toe when I got her. She is tender, actually walking on the bulbs of her hinds right now.... I'll look into the Finish Line product. She came on a biotin supplement, expensive stuff! Can't say her feet look any healthier than the rest of the horses. They are all on pasture but our ground is really dry and hard here, mostly decomposed granite and red clay. Hi Danastark. Is there anyway you could post pictures? Yes, diet is important to feeding the hoof......things like trace minerals, lysine, methionine, biotin etc. Sunflower seeds, like flax seeds are fat. It will help with the quality of the oils and waxes in the hoof, and other places in the body, like the coat, but that's about it. Fat is fat and is nothing more than that. What BOSS and Flax have vs. other oils, is to provide the omegas. The two are like yin and yang in life...the good guy vs. the bad and how it takes both to keep life balanced. Omega 3 is an anti-inflammatory. Omega 6 is an inflammatory. Boss is much higher in Omega 6 than 3, which promotes inflammation in the body. Flax is higher in Omega 3 , which fights inflammation, which makes Flax the winner. Flax is 3x higher in Omega 3's than 6's, which is the perfect combination for a horse going thru all the rigors of life. It's the older horse that needs a touch of BOSS to keep his emergency system operating and talking to you about things. So, the next time anyone touts BOSS, think FLAX instead and fight inflammation and all the nasties it causes. 4oz of fresh ground flax/day, is the only fat you need. I buy a bag of flax seed that lasts about a year and grind up a handful in a $10 coffee grinder just before feeding. (and its only needed in winter, on a hay only diet) Still, fat is just fat and not the nutritional answer for the hoof. The real winners are the trace minerals, with zinc and copper being the star players. Biotin is simply a B vitamin. It does not speed up growth, but helps to improve the new growth, which will finally shows itself 6-7 months down the line. Not many of the store bought feeds has sufficient amounts of it. Another star player is fighting thrush until its all gone and lots of movement to develop. As soon as we dry out some, I'll get some pictures of her feet. She is managing OK on trail with just front shoes and the farrier said her hind heels look better. Dana is in CA with the deluge of water falling at the moment. Missyclare are you strictly hoof? I see you are nutrition as well... Do you know anything about Dynovite? I used it for my itchy dog a while back. Gave it to both dogs and my itchy dog seemed to benefit. They have horse stuff, too. I know an itchy horse... I don't want to hijack Dana's thread. I'm under 2' of snow and doing the chores is absolutely exhausting, though I'd prefer it to a deluge of water anytime. Wishing for drier weather ahead, Dana. It was the barefoot trim that morphed into nutrition and feeding the feet for me. It was right around the time that IR/Cushings was gaining awareness. So, I've gone from trimming to nutrition, to cushings so far. I live a frugal life at the barn and when I stepped back and put it all together, I ended up with the horse management system that I have today. I have a barn full of gravel and no longer buy bedding, no stalls, gravel in the round pen, a pasture paradise, balanced diets and rock crushing feets. I lost my namesake, Missyclare just before Christmas. She never would drink enough, no matter how much salt I fed her. We had a turn in the weather to cold and she colicked and it could not be resolved. I had to put her down. She was thirty. Just two days before that, I watched her lift herself into the most beautiful lope that only a quarter horse can do. That's how I will remember her. If the pic shows up, that's her on the right at 27. As for the Dynovite, it sounds like a good supplement for dogs. A good move for covering all the bases. They've got a 90 day free trial, so why not? I'm thinking it should only take a month to see if there is improvement or not. I've seen dogs on kibble only diets that have all these coat problems. This may help, Mostly its that dogs are predators and have systems for wet food. I do start the meal with kibble and add either a can of good dog food, stuff from the kitchen, or I make ground chicken and rice balls and add that to the kibble., to eliminate having to buy the cans. But then I add water and make it soupy and make them drink as well. 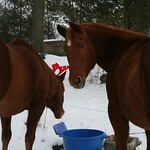 With both the horses and the dogs, everything delivered in a pail is wet. Always promoting water consumption, except for the kind that Dana has, lol! So sorry for your loss. She was a lovely chestnut girl, wasn't she? What an intelligent expression on her face. I lost Master Miles. My other two are still at Dawn Darnell's next to Steve Johnson's. So Steve still does their feet and Dawn does their teeth. It's paradise for them. I'm hoping for a job offer where I can bring Zag home. I add water to the dog's food, too. They're doing pretty well at the moment. I saw the Dynovite for horses. So good seeing you here. If the terrain is hard I would recommend using easy boots.